According to a recent graduate study by IES Abroad, students who study abroad have higher acceptance rates into graduate schools, secure jobs more quickly and have higher starting salaries than their classmates. For that very reason more than a hundred Southern Utah University students took their education from the classroom into the world with the study abroad opportunities offered by SUU this summer. 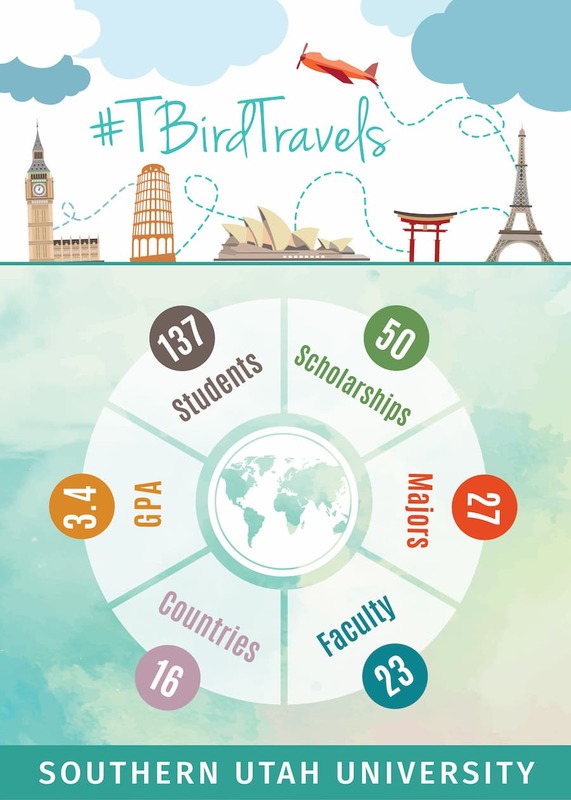 The study abroad program, which is organized through the Sargon Heinrich Global Engagement Center, took 134 students with 27 different majors to 16 different countries from Ireland to Australia. Sierra Bonner, a senior strategic communication major from Heber City, Utah, traveled to Tonga and witnessed the differences in cultural communication styles. By observing the Tongans and experiencing their generosity, Bonner learned more about the importance of being grateful and helping others. Shon Spevak went to Central Europe to study about comparative public policy. It surprised him how easy it was to connect with the people and realized that, despite language barriers and cultural differences, people all over the world have a lot in common. Elizabeth Judd, a senior Spanish major from Maplewood, Minnesota, traveled to Costa Rica to improve her language skills and learn more about the culture. She spent three weeks volunteering at an orphanage and one week doing service in one of the poorest neighborhoods in Costa Rica. Studying abroad provides the opportunity to take education out of the classroom and into the world. Students are able to learn from different cultures, find new interests, serve, improve language skills and make lifelong friends. To learn more about the SUU study abroad program, visit the Sargon Heinrich Global Engagement Center website.